Just returned from an uneventful one day trip to Rachael and the surrounding area. I saw 2 of Steves livestock that no longer are in his inventory as they are stiff along the side of the road between GLR and the Mailbox. I was at Coyote Summit at 10:00am and saw nothing although the scanner was busy with hostiles at 15,000 feet. There was a very clear sky with no clouds and I didnt even see contrails, so they must have been out of my area. Either that or my scanner is better than my 10x50s. Stopped at the Quik-Pik and ran into Chuck Clark whose duty for the day was to repair the local cable system. After a chocolate marshmallow cookie purchase and a Pepsi I drove over Queen City Summit to check out the new blacktop to the gate. They ought to pave all the entrances like that. Much quicker and way easier on the vehicle. Saw the usual stuff. Cows and desert. There was a big front loader at the gate and a belly dump next to it. Not very exciting. As usual the light was flashing on top of the guard house. Still cant figure that out. 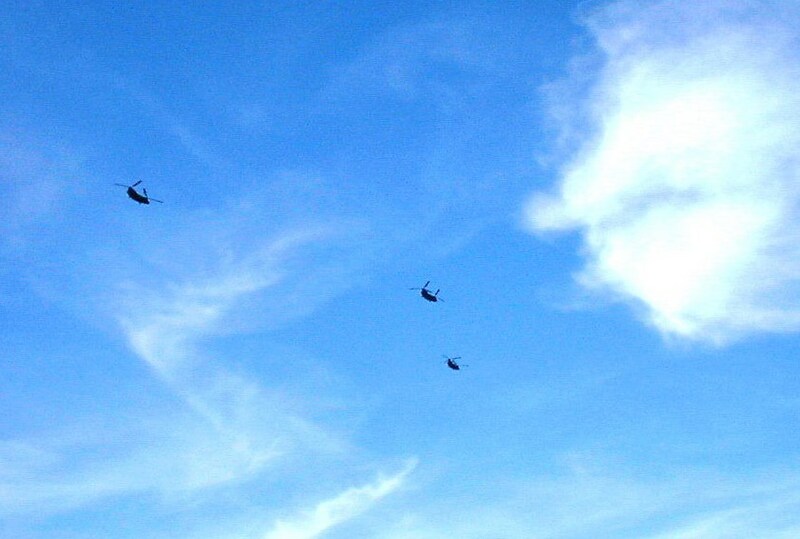 As I was leaving these choppers came over the border south to north. The scanner didnt have anything on it except the dog fighting that I never saw. Maybe I didnt have their frequency programmed in. Left there for lunch at the Inn and paid my respects to Pat as Joe was elsewhere. On the way back to Vegas stopped at the Nellis north fence and saw the usual A10s and the TBirds coming back from Indian Springs. The wind was 35mph with gusts to 50 so they were landing south to north. Hardly ever see that. Maybe more excitement next trip.